Here below is the brief essence of the Philosophy of Bhagwat Gita. 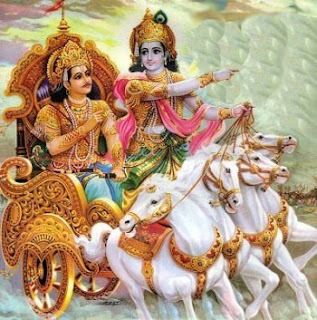 Teachings of Bhagwat Gita were given by Lord Krishna, the God Himself to his disciple Arjuna on the battlefield of Kurukshetra in Haryana State of India. These teachings were given more than 5000 years ago but these are still relevant today in our lives. Whatever happened in the past, it happened for the good; Whatever is happening, is happening for the good; Whatever shall happen in the future, shall happen for the good only. Do not weep for the past, do not worry for the future, concentrate on your present life. What did you bring at the time of birth, that you have lost? What did you produce, which is destroyed? You didn't bring anything when you were born. Whatever you have, you have received it from the God only while on this earth. Whatever you will give, you will give it to the God. Everyone came in this world empty handed and shall go the same way. Everything belongs to God only. Whatever belongs to you today, belonged to someone else earlier and shall belong to some one else in future. Change is the law of the universe. You are an indestructible Soul & not a body. Body is composed of five elements - Earth, Fire, Water, Air and Sky; one day body shall perish in these elements. Soul lives forever even after death as soul is never born & never dies. So Why do you worry unnecessarily? What are you afraid of? Who can kill you? Devote yourself to the Almighty God only. One who takes the support of God, always gains freedom from fear, worry and despair.